These devices work on the quantum mechanical level to eliminate sub-audible noise—i.e., noise unmeasurable by typical test-bench instruments. The results are previously unattainable resolution and beauty in home audio and video. For more than twenty years Original Equipment Manufacturers (OEM) and customers have used Bybee Quantum Purifiers to enhance the performance of nearly every level of audio and video system. Experienced audiophiles with knowledge of electronics and good soldering skills can improve the sound of their system components at very reasonable cost by installing Quantum Purifiers themselves. Loudspeaker upgrades are just as easy. These purifiers will require a break-in to sound best. See our DIY Guidelines and Tips section. Bybee Technologies also has two lines of upgrade products that require no skill in installation - called "Power and Room Products" and "Plug-in Products". These products are user ready, only requiring a break-in period to reach full potential; and each is manufactured with our latest purification and spintronics technology. The products in our "Power and Room Products" include our iQSEs, Quantum Signal Enhancers, Active and Passive Room Neutralizers and Power Cords. Our "Plug-in Products" include the RCA Adapters and Plug-in Speaker Bullets. 30-DAY RETURN GUARANTEE: Bybee Technologies and all authorized Bybee resellers offer a 30-day money-back guarantee if the customer is not satisfied with any purchase. WARRANTY: Bybee Technologies warrants all Bybee products against defects in materials and workmanship for one year from the date of purchase. This new product replaces the original Bybee Large Regular Quantum Purifier. It has been re-designed and engineered to be smaller than the original model, yet is even more effective. This product is made with 14 gauge copper leads, which is suitable for handling currents up to 15 amps. The Large Regular Quantum Purifiers can be used in-line in most any signal application consistent with the current handling capacity. This product will reduce noise and improve the overall signal to produce better detail resolution and greater warmth and harmonic richness. This product is included in the Speaker Bullet Kit, and is typically used on the negative leg. Lower current applications should consider the Slipstream Quantum Purifiers. Potentially higher currents should consider using the AC Bullet. Theis new Internal Speaker Bullet is designed as an alternative or a complement to the Internal Speaker Bullet Kit. This device has 1 inch long leads made of 14 gauge copper wire. Designed and constructed with a higher level of treatment, this product delivers detail resolution, warmth and harmonic richness unsurpassed in our other purifiers. This product is primarily designed for internal application inside of speakers between cross-over and terminals; and on the positive leg. However, it can be used in same applications as Regular Large Purifiers when pricing is not an object. Large Gold Quantum Purifiers are typically used in AC applications (especially recommended for solid-state electronics), and with loudspeaker transducers, especially electrostatic and metal-driver designs. Specially shielded using ERS Stealth carbon fiber material. Small COPPER Slipstream Quantum Purifiers are typically used in lower-current AC circuits, non-AC analog and digital circuits, and smaller mid-range drivers and tweeters. This product is made with 18 gauge copper wire. This product will reduce noise and improve the overall signal to produce greater resolution and definition with an organic touch. Wire upgrades are available in silver and gold, which add another dimension to the improvements. Higher current applications should consider Large Regular Purifiers or AC Bullet. May be substituted for Copper Slipstream purifiers for enhanced performance in any application. Small SILVER Slipstream Quantum Purifiers are highly recommended for DIGITAL circuits, inputs and outputs. This new AC Bullet was designed to purify the incoming AC to be utilized in all types of equipment. Like all Bybee products, it is passive. It is designed to handle spikes and current up to 20 amps. Use is only limited to available space in the product being modified. Made with 12 gauge copper wire and one inch leads, this AC Bullet conditions and improves all AC signal paths, delivering improvements to the performance of all components. Typical uses include placement at IEC in component on positive leg. Power conditioners, Amplifiers, DACs, and Pre-Amps will all benefit from this product. In addition to audio, this product can also improve video. Lower current applications can consider Large Regular Purifiers or Small Slipstream Purifiers. This product kit is designed for OEM speaker manufacturers, audio modifiers and DIY hobbyists seeking a higher level of speaker performance. This Speaker Bullet Kit will deliver stunning improvement in detail retrieval, ambience and spatial presentation, vocal and instrumental color, transient and dynamic impact, and harmonic completeness. It is designed to be installed internally in the speakers and placed after the speaker terminals and before the crossover network. The Internal Speaker Bullet Kit is an equally high-performance alternative to the critically acclaimed Plug-in Speaker Bullets product. 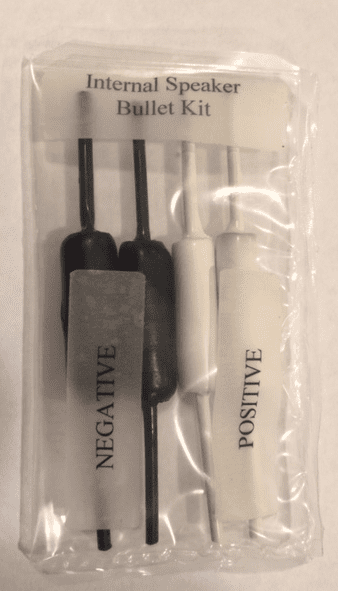 Each Internal Speaker Bullet Kit contains two Internal Speaker Bullets for the positive legs and two Large Regular Purifiers for the negative legs. 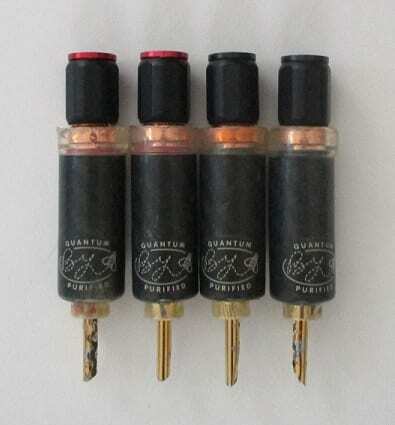 The Positive elements are the Internal Speaker Bullet (shown below) with one-inch leads. The Negative elements, for maximum sonic performance and quieting on the return leg of the connection, are the Large Regular Quantum Purifier (shown above). 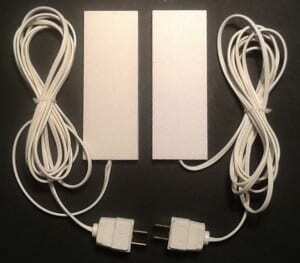 One package of the Internal Speaker Bullet Kit treats a pair of single-wired loudspeakers. Bi-wire speakers require two Kits. For the audiophile who demands the absolute best performance attainable, a Positive and Negative pair may be installed right at each transducer rather than just before the crossover network after the binding post. Extremely flexible, 6 foot cord, with grounded shielding. Both end plugs are YA Grofei top graded audio plugs, with pure copper conductors, 99.9% Rhodium plate, with a graphite fiber surrounded aluminum case. And best of all, the wire and signal are treated with Bybee Technologies’ unique proprietary process that makes this product stand out from any other power cord on the market. No other power cord features this same technology! The Bybee – Quantum Signal Enhancer by Bybee Technologies will transform any audio or video component and audio system to a higher level of performance with quantum proton alignment. This product may very well be the most economical and effective system/room treatment device on the market. All models of the QSE are energized by surrounding electromagnetic energy, but this unit is now has an internal design and engineering that makes it even more effective than prior model. This QSE will last a lifetime without losing effectiveness. 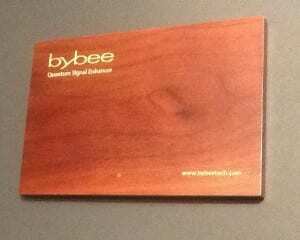 The Bybee-QSE is a compact (4 X 6 X 1/4 Inch) attractive walnut wood panel, with a felt-covered bottom. How it Works: The QSE affects the polarity of all electrons and protons within it’s magnetic field, affecting their oscillation by making them more aligned with each other. 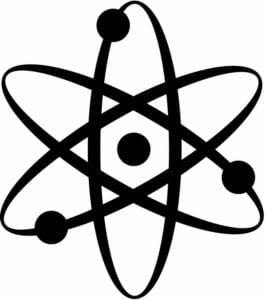 This reaction creates an affect the makes the transfer or sharing of electrons more streamline and efficient. The results are a stunningly enhanced purity and energy of the signal. This device, when placed under/over components, speaker wire, interconnects and power cords reduces noise and hash to dramatically improve the components’, and speakers’ efficiency. The results are improved resolution, soundstage, dynamics, and overall musicality. 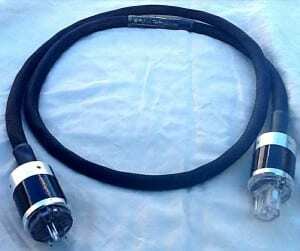 The QSE works even with heavily shielded audio cables designed to withstand RFI/EMF noise from the electrical grid. How to use it? The QSE is typically placed under/over any kind of signal-carrying wire(s), and components, and power supply. One QSE may be used with multiple signal-carrying wires; there is no need to have a QSE on each wire. The effects of the QSE are accumulative, so multiple QSEs will continue to improve system and room performance. Benefits Even the best high-definition television or any kind of imaging monitor will display better contrast, visual detail and color fidelity. In audio systems, bass frequencies are faster and more impactful, and high frequencies become more extended, more open and natural, without edginess. The critical midrange sounds more musical, more liquid and less “electronic.” The overall presentation of imaging and soundstaging becomes both more precise and more enveloping. The new Bybee iQSE is designed to be installed inside of components. 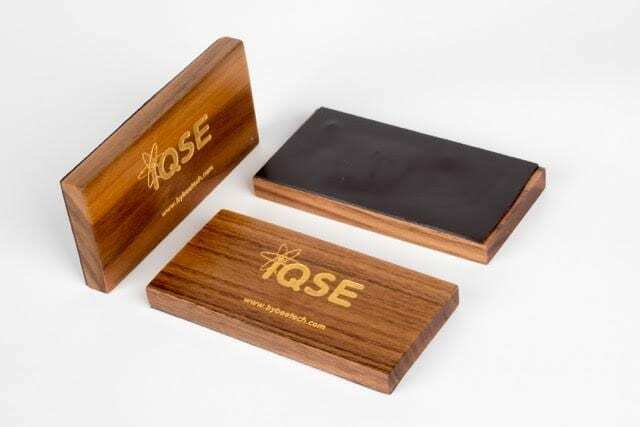 The iQSE is a passive device that is activated by electromagnetic energy and is ideal inside of components where the electromagnetic energy is at the highest concentration. No soldering is required, and the units can withstand high heat situations. Placement can be done simply by using the attached magnet or included double stick tape. Placement can be on any wall at the inside of the component chassis. This product works similar to the popular QSE, but it’s small footprint (4″ X 2″) and design makes it ideal for internal placement. Once installed the iQSE creates an electric and magnetic field that in turn effects the surrounding electrons, rendering them more streamline and efficient. The results are a stunning improvement in overall musicality. The iQSE can be installed with either side up, and can withstand heat. It will be effective in most any space inside of a component. It is a passive device that will not lose effectiveness over time. This product, like all Bybee products, has a cumulative benefit; and it works very well together with other Bybee products. The iQSE has been tested with favorable results on the home electrical service panels, power supply, rear terminals on speakers, and most any location. The Bybee – Passive Room Neutralizer is a revolutionary product virtually eliminates surrounding walls in a listening environment. 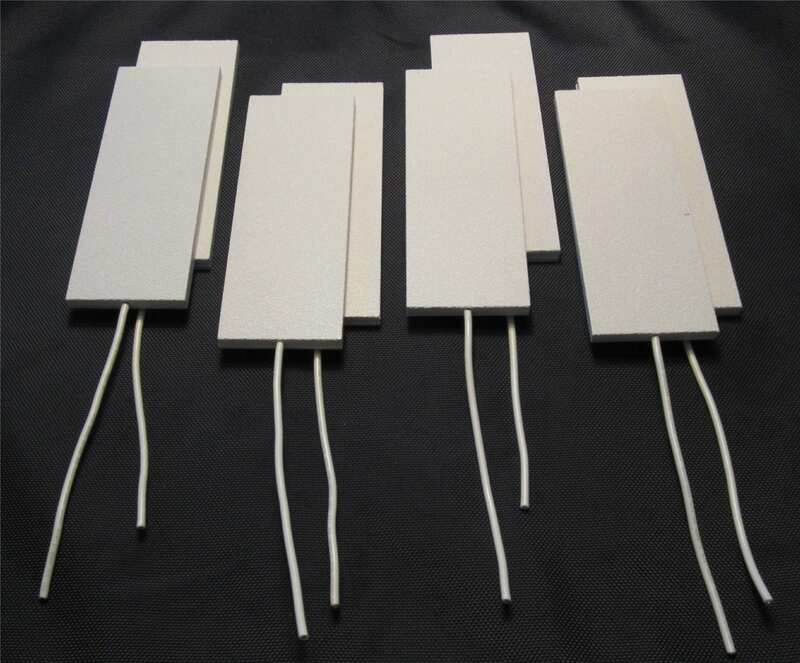 These are passive devices that are designed to be discreetly placed on walls behind pictures, wall ornaments, fixtures, furniture, etc. Introduced to the Bybee product line in 2017, these Active Room Neutralizers are a compliment to owners of the passive Room Neutralizers; or they can be tried on their own with great results. Each ARN is engineered with Bybee proprietary technology and have a 2-prong US plug attached to 10 feet of cord. They can be plugged into any electrical outlet. EU users can use a plug adapter on the units without problems, as the units do not draw a current. They are designed to activate the internal technology with energy rather than current, thus creating both an electric and magnetic field. When activated the units effect the air molecules in the room, rendering them compliant to sound waves. The results are astounding, with improved resolution, sound stage and overall musicality. Listening room issues prior to installation of the ARNs are nearly obsolete. Recommended placement of 2 ARNs is 4′ – 5′ from ground directly behind speakers. They can be hidden behind curtains, artwork, furniture, etc, without effecting their performance. Each listening room and system is unique, therefore users should experiment with placements to discover best positioning of the ARNs. Each position change of the ARNs produces changes to sound. The Plug-In Speaker Bullets deliver stunning improvements in detail retrieval, ambience and spatial presentation, vocal and instrumental color, transient and dynamic impact, and harmonic completeness. With a a simple plug-in connection, the Plug-In Speaker Bullets surpass even the benefits of all but the most extensive system-wide internal Bybee modification upgrades to amplifiers, pre-amplifiers, loudspeakers, cables, etc. The Plug-In Speaker Bullets incorporate a newly developed combination of aluminum casings and new proprietary wire that surpasses the gold wire originally used in earlier products. 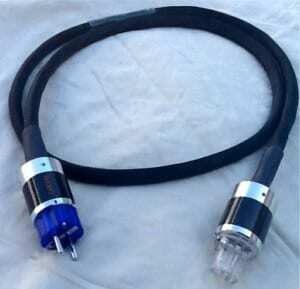 The termination on this product utilizes the highest quality silver banana plugs and 5-way binding post terminals for the receiving end of the speaker cables. Although dramatic sonic improvements will be quickly audible, an burn-in period of 100-200 hours will enable the Plug-In Speaker Bullets to reach full performance. These short single-ended interconnect Adapters utilize Bybee Technologies' latest techniques. The sound? Music is airier, the sound stage is wider, deeper, more dimensional and the music just flows effortlessly. 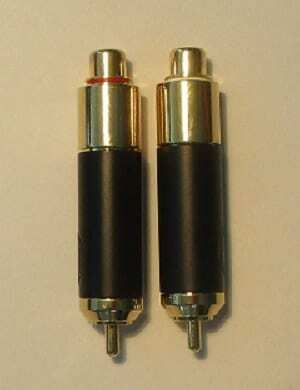 These Gold RCA Adapters will reduce digital harshness. With the Bybee RCA Adapters in place, those digital recordings that you love the music, but hate the sound suddenly become MUCH more listenable, and downright enjoyable. The Bybee RCA Adapter should be placed on the interconnects leading from your source components at the signal destination end. The products is ideal for turntables, but also works great with amps, pre-amps, DACs, etc. Pricing Note: Bybee Technologies does not sell from this website. Persons interested in our products should contact one of our dealers listed here. Price listed is our suggested retail price. Dealer pricing may be different. © 2018, Bybee Technologies LLC. All Rights Reserved.